I've seen a number of Lego robots that can follow lines. I've also seen a number of bipeds. However, I have never seen a biped that can follow a line, which made building one an appealing challenge. This is the result of my efforts. The robot steps by rotating on one foot while the other foot is lifted off the ground. It uses three motors, one in each foot to drive the rotating bases, and one to shift the RCX from side to side (thereby shifting the weight from one foot to the other). The feet are lifted by rubber bands. When the RCX slides over the top of a foot, it pushes the foot down. That foot touches the ground just before the center of gravity shifts to that side. Shortly thereafter, as the RCX continues to slide across, the other foot is released. 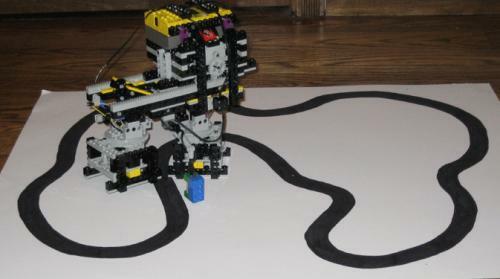 The rubber bands lift that foot, allowing the bot to rotate on the base of the foot that is now taking the weight. It rotates until a light sensor on the front crosses the dark line, and then repeats the process on the other foot. pls can i know this project's detail?? You do awesome work Blake Sir. Your robots are just amazing.